Mary Harvey says Steve (her second husband) took everything from her, including their son Wynton, the money, and their home. She was allegedly evicted and left homeless and broke. 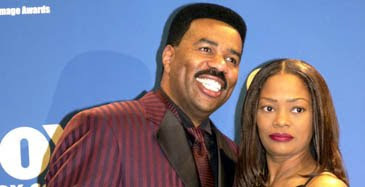 These are the three videos Mary has posted on her allegations of how Steve moved new wife Marjorie into their apartment without apology, and how he's now suing Mary for his inability to land a relationship TV show on Oprah Winfrey's OWN Network. Maybe this is Steve Harvey's idea of thinking like a man. What's Steve Harvey's reaction going to be? Will it play out in the media or on his radio show? ...Somebody give Mary a reality show or at the very least a book contract!